Content has recently started migrating away from the Justice website. We’d just got used to the new Justice portal when GOV.UK came along promising to be the new single domain for government information (see the March issue). According to the Justice home page, “Ministry of Justice corporate content has moved to the new single website for government GOV.UK.” But what does this mean? I recently had a meeting with the Government Digital Service who explained the general plan. Ministry of Justice corporate information has already migrated to its new home in the Departments and Policy section of GOV.UK at gov.uk/moj; the corporate information for the dozens of its agencies will be migrated to GOV.UK over the next year (target completion April 2014); and the specialist information and tools will migrate over time in a manner yet to be determined (ie specialist consideration required for each). News and policy information from the site was moved over to GOV.UK in April. The next step will be to move over the “specialist” tools and information for professionals and practitioners, such as lawyers. This includes everything from training materials for youth offending teams to guidance for coroners. The aim is to get this on the new site by early 2014. As we said in our digital strategy, we’ll be using this as an opportunity to rework, rewrite and improve the content wherever possible. This will be a big challenge given that the content is generally more complex than information for the general public. However, we know that professional users are often busy and have to find what they need quickly. 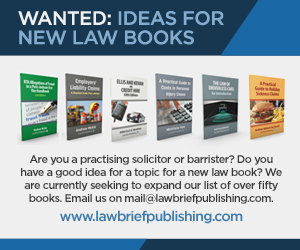 Some of the information will also have to be made more accessible for non-professionals, like those who represent themselves in court hearings or at a tribunal. There’s no doubt that the government’s “Digital by Default” strategy will both help MoJ achieve some of the savings they crave and deliver better services. It will transform the services we provide, the way we work and the systems and processes that underpin these priorities. It enables us to design services around the needs of users to support better outcomes, whether that means tools to help rehabilitate offenders, providing victims with more information about their case, or allowing individuals to file claims more easily. It allows us to deliver solutions at pace that are simpler, easier to use and better value for users and the government. Delivering digital services that people prefer to use allows us to dedicate alternatives like phone helplines to those who really need them, while reducing demand on these higher-cost channels. 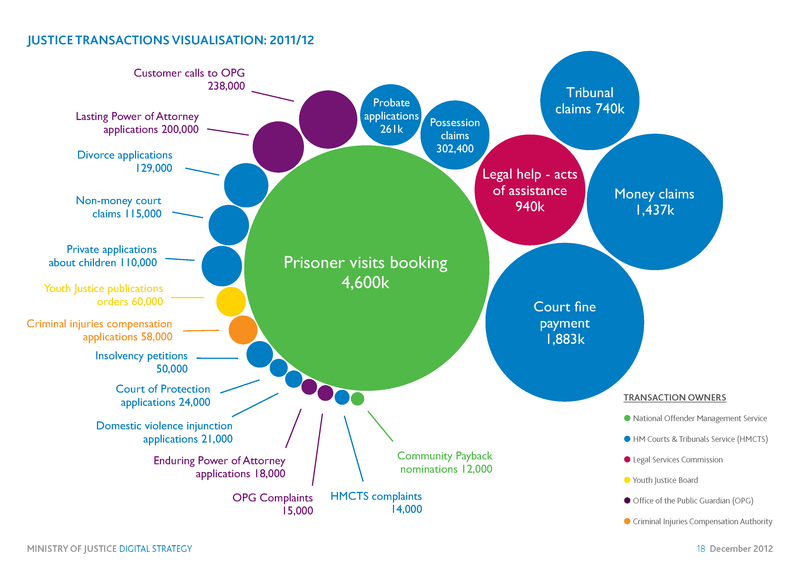 In the Digital Roadmap in Annex 1 to the Digital Strategy, the Justice Transactions Visualisation shows how many transactions with Justice are undertaken each year. Simply put, the bigger the blob, the bigger the imperative to digitise the process. The MoJ Digital Roadmap shows how these transactions, services and information resources are scheduled in for development. Note that the development of these services is going on on GOV.UK rather than the Justice site which will gradually disappear. Already there are a number of guides on GOV.UK to legal processes like divorce (and related), probate and employment issues, eg employment contracts. These are not earth-shattering developments, but they do deliver “simpler, clearer, faster” information than what was on HMCTS/Justice before – largely collections of PDF leaflets. There are some transactional services that were already fully digitised but will now be redeveloped according to the new GOV.UK “agile” standards. These include Money Claim Online and Possession Claim Online. 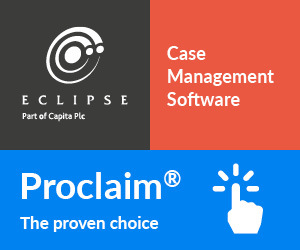 A good idea of the direction of development is given by the Lasting Power of Attorney service and Employment Tribunal Application which are two of the first of the Government Digital Service’s “digital exemplar” services to reach beta stage. 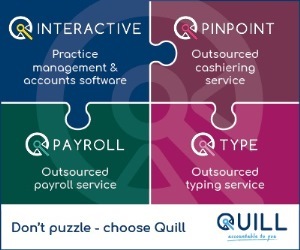 Not only will digitisation of these services reduce government expenditure, but it will also reduce the need for users to rely on lawyers (or other providers) for many of the straightforward processes which we have tended to regard as legal, but which are in fact intelligent, assisted form-filling. That’s not to say I predict the end of lawyers or the end of private online services in these areas; it’s just to point out that if GOV.UK can deliver a “simpler, clearer, faster” service that meets at least basic “legal” needs for common transactions with government, then we can all move on to improve on the services that are in more need of private and third sector attention. 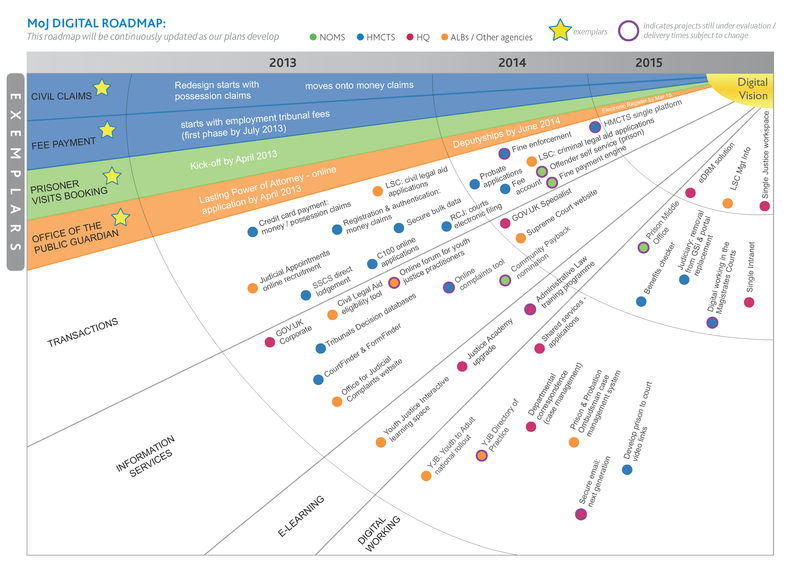 You can view the progress of development of GOV.UK’s 25 digital exemplar services, of which 4 are MoJ projects, from the Digital Transformation dashboard.